If you are on the look out for a fabulous Easter dessert, your search is over, you just found it! I’m not sure why, but coconut desserts are so popular for Easter. I happen to love coconut, so this is totally ok with me! 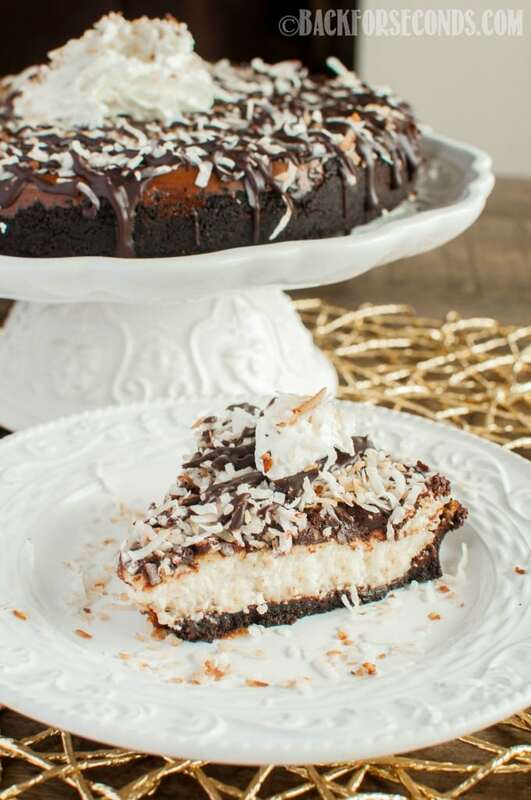 This Toasted Coconut Fudge Cheesecake would be the perfect finish to Easter dinner – or brunch! Who could resist? I realized recently that I have a shortage of pies and cheesecakes on Bake for Seconds. I have no idea why, but I just don’t bake them all that often. We make things like these Double Decker Coconut Cream Brownies all the time, but pies? Not so much. Enter the idea for this cheesecake pie! Start with the crust. Oreos: both the cookies and the cream filling, and some butter. Done. Then there’s a layer of fudge because, why not? Next up is the creamy, coconut cheesecake. Nom nom. And because ganache is my favorite, I had to pour some over this decadent pie. 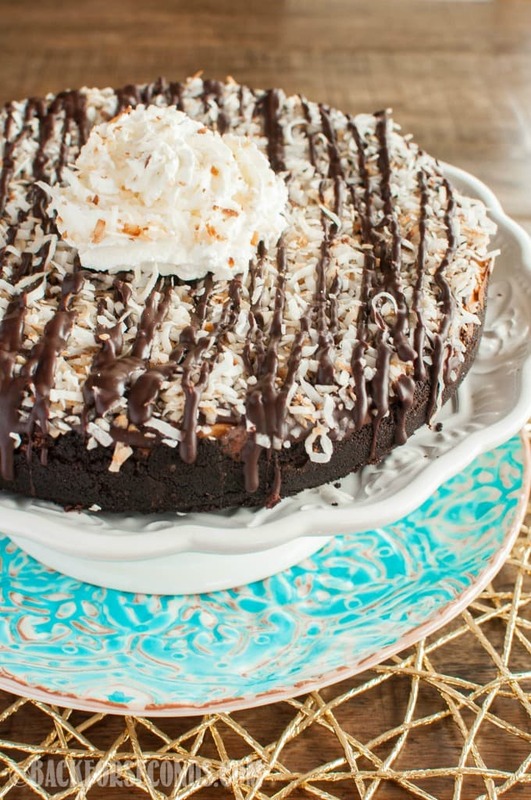 Toasted coconut tops it all off…pass me a fork! 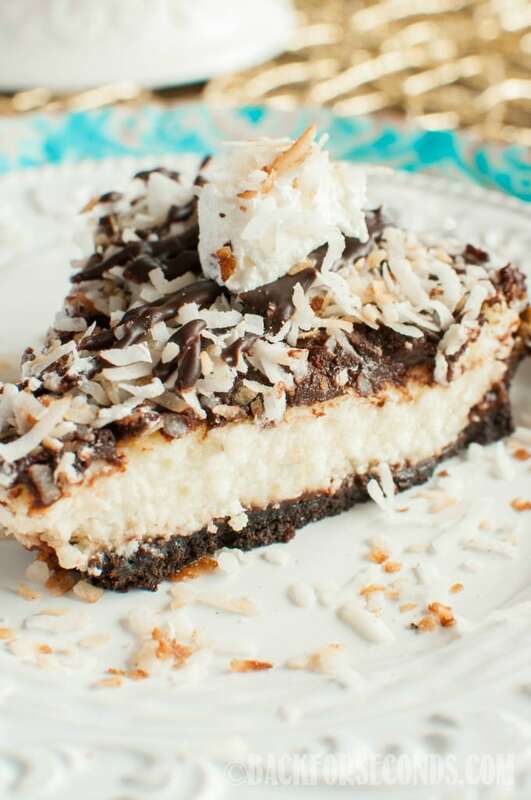 Chocolate and coconut is one of my favorite dessert combos. I have feeling I would fall head over heels for this cake! I am a sucker when it comes to cheesecake! This looks soooooooooo decadent and delish! What a fabulous way to celebrate! This looks incredible, coconut is my weakness! Pretty much anything that starts with an Oreo cookie crust and ends with cheesecake is a good idea. This looks so fantastically decadent! 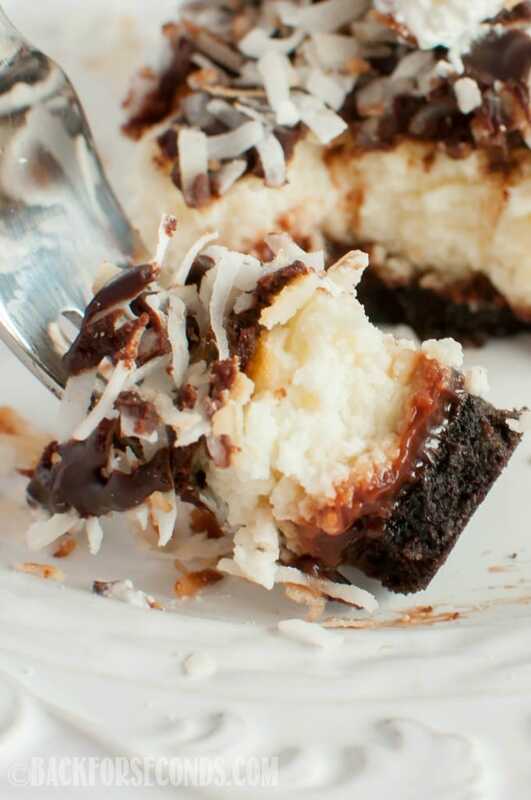 Coconut + Fudge + Cheesecake… what more could I want! Wow, that looks SO good, I want a huge slice of it right now!